To Russians, Sergius is both a national hero and an example of Russian spiritual life at its best. His posterity reminds us of Joan of Arc with the French or Martin Luther for Germans. He was born in Rostov (Rostoff) around 1314 to boyars Cyril and Maria and baptized Varfolomei (Bartholomew). The family moved closer to Moscow, settling in the village of Radonezh. Varfolomei became Sergius upon taking his monastic vows. When he was twenty — and after the deaths of his parents — Sergius left his inheritance to younger brother Peter. He joined his elder brother Stephan and began living as a hermit. 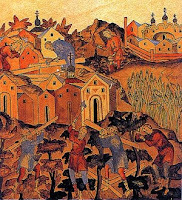 When Stephan left to head the Pokrovsky monastery at Khotkovo, Sergius soon followed him. Others joined them in what became the Monastery of the Holy Trinity, a center for the renewal of Russian Christianity. Pilgrims came from all Russia to worship and to receive spiritual instruction, advice, and encouragement. At the time, Russians were largely controlled by the neighboring (non-Christian) Tatar (or Tartar) people, a group descended from the Mongol hordes. Sergius rallied the people behind Dmitri Ivanovich, who began an extended process of moving the Russians out from under Tatar rule. When Mongols under Mamai moved on Moscow, a Muscowian army, led by Dmitri, repulsed the invasion. Mamai escaped, established pacts with the Lithuanians and with Oleg, Kniaz of Rjazan, and led a larger force upon Moscow in 1380. 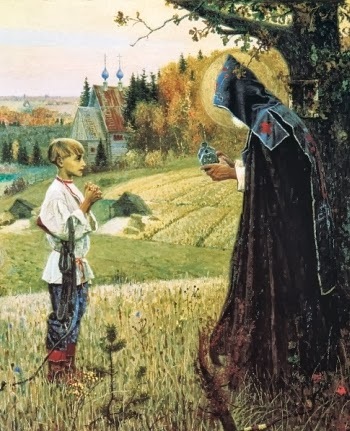 Sergius blessed Prince Dmitri with the words, "Go fearless prince and believe in God's help." Dmitri led the Russians to victory at the Battle of Kulikovo, thus hastening the establishment of an independent Russia. Despite his exhortations to battle and blessings upon prince and soldiers, Sergius possessed a winsome personality and was a gentle man. Accounts bear strong resemblance to those told of Francis of Assisi, including a special affinity which he and animals held for each other. He had the ability to inspire in men an intense awareness of the love of God, and a readiness to respond in love and obedience. Metropolitan Alexis of Moscow loved Sergius as a friend, entrusting him with such important tasks as peacemaking between rancorous princes. Despite rubbing shoulders with the wealthy and powerful, he remained close to his peasant roots. One contemporary said of him, "He has about him the smell of fir forests." To this day, his effect on Russian devotion remains considerable. The life and work of Venerable Sergius have a special place in the history of Russian monasticism. His cloister served as an example of secluded ascetic life for later monasteries. Starting from scratch, the monastery first needed almost everything: Chasubles were hand painted, chalices were made of wood, they burned splinters instead of candles for light in church. Still, devotees were zealous and Sergius was a model of asceticism, deep humility, and staunch faith in God's help. He was a true leader in work and services and the monks followed his example. The blessing of Dmitri and the prince's subsequent success encouraged Russian nobles to contribute to the support of Holy Trinity Monastery. In the following years, peasants started settling nearby. Because of its location near a main road to Moscow and points north, it gained even greater financial support. Increased income to these ascetics meant increased giving, leading the monks of Holy Trinity to follow the example of the Kiev-Pechora monastery in generous almsgiving and the provision of shelter and support for sick and traveling people. Sergius's renown spread as far abroad as Constantinople, from whence Patriarch Philotheus sent him his blessing. The patriarch also produced a written endorsement decreeing that monasteries under Sergius would henceforth use the new rules of community cloister life established by the founder of Holy Trinity. Two major convents on the outskirts of Moscow preserve the recollection of the freedom for which he urged Dimitri to fight. One is the fortress of the Donskoi Monastery, under the Sparrow Hills. The other is the Simonov Monastery on the banks of the Mosqua — a place of beauty chosen by the saint himself and established in 1370 by monk Feodor, a nephew and disciple of St. Sergius. When eighty-four year old Metropolitan Alexis knew his life was ending, he desired to give Sergius his blessing while also appointing him as successor. But the humble monk, in great alarm, declared that he could not accept the honor. Saint Sergius died at an extremely advanced age in 1392, to the almost universal sorrow of the Russian people. O God, whose blessed Son became poor that we through His poverty might be rich, deliver us, we pray, from an inordinate love of this world, that we, inspired by the devotion of Your servants such as Sergius of Moscow, may serve you with singleness of heart, attaining to the riches of the age to come; through Jesus Christ our Lord, who lives and reigns with You and the Holy Spirit, one God, now and forever.